Fast-growing fitness player Peloton recently found itself caught up in a Twitter roast, when a user of its fitness bikes poked fun at the brand, tweeting about Peloton’s aspirational ads. The company’s president is taking it all in stride. 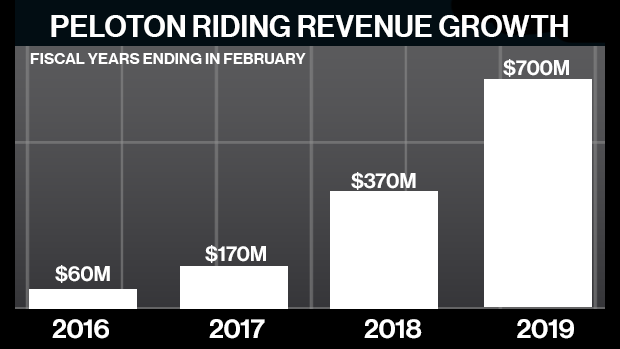 “If people are talking about the company, it’s probably a good thing,” Peloton President William Lynch told BNN Bloomberg in a television interview. Peloton’s pricey bikes (which cost roughly US$2,000 each) may not be for everyone, but there’s no doubt people are talking about the product. Peloton was founded in 2012 and didn’t sell its first bike until 2014. Today, the company says its indoor exercise machines have more than a million users, who access all sorts of live and on-demand classes, from spinning and yoga to boot camps. The company has benefited from a core group of loyal customers who became evangelists for the brand. For Lynch, a former Barnes & Noble CEO who joined Peloton in 2017, the focus is all about what users do when they’re on the bikes. “We think the crown jewel of the company is the Peloton membership, which is the month to month payment you make to access Peloton content. We think it’s the best fitness content in the world,” he said. And according to limited financial information Peloton provided to BNN Bloomberg, that content is catching on. The company is on track to top US$700 million in revenue in its fiscal year, which ends in February. That’s up from US$370 million a year earlier, and a massive jump from just US$60 million three years ago. The business model has prompted some to position Peloton as the Netflix of fitness. And like Netflix, Peloton, which has US$500 million in cash, plans to keep spending on talent from the fitness world. “You will see us, like Netflix, continue to invest in content,” Lynch said. Of course, some hardware players have had a tough time transitioning into full-fledged media businesses. Take GoPro Inc., which went public in 2014 with promises of becoming a media company. The action camera firm’s stock now trades at a fraction of its IPO price.